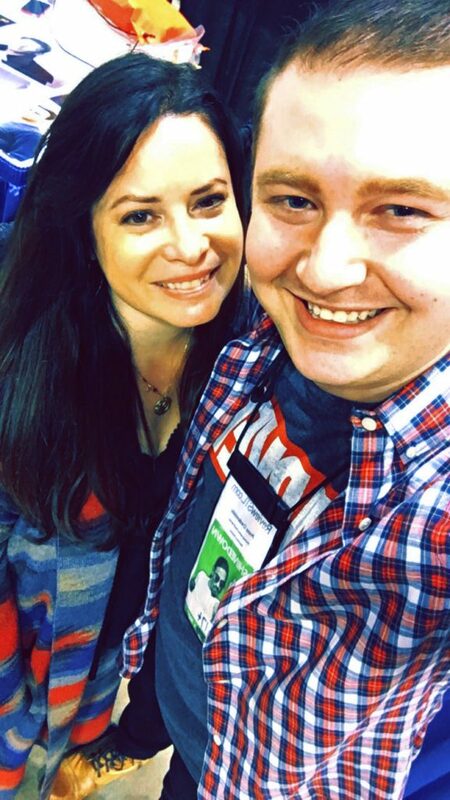 Holly Marie Combs, most famously known as Piper Halliwell from the WB’s hit supernatural series “Charmed,” has come to St. Louis this weekend as a guest to Wizard World Comic Con at The America’s Center. In between meeting fans for autographs, professional photos, and joking around with fellow castmates Brian Krause and Drew Fuller (who portrayed Combs’ on-screen husband and son). Holly was kind enough to answer a few questions for ReviewSTL. Holly Marie Combs at Wizard World after our interview. The powerful Charmed One who had the ability to freeze time was intrigued by how many fans have come to love the show after it’s original airing. Combs was surprised at the number of individuals whom she has met through events such as Wizard World who have come to develop their fandom through reruns or have since the show has been off the air, rather it be after work or school, or to her surprise, some even watching the show early in the morning. Combs, a mother of four herself, mentioned that it’s a blessing to mothers everywhere if their kids are up in the morning watching “Charmed” before heading off to school as she joked that she can barely get her kids out of bed in the morning herself. On being asked about her fondest memories of being on set, Combs was happy to reminisce about how pleased the cast and crew were that the show was successfully on the air for eight years. Throughout that time, they developed such a closeness that it was almost as if being on set was like a second home, as many of them developed such strong relationships that they consider each other family. Referring to fellow guests Fuller and Krause, Combs was happy to admit that she “drags these two wherever I can.” She also keeps in touch with other members from the show, as they have been a part of her life for nearly a decade, and the closeness she was with them is still flourishing. On empowering young women by playing a strong female protagonist, Combs admitted that she didn’t realize the scale of influence both her and her fellow sister witches had on the youth who have watched and are still watching the series. She stated, “It was very important to be authentic, and to be real, and to represent our family and our family ties.” There was also a key point that the production team of the series wanted to convey to the audience members, and that was these three characters were “three sisters who happened to be witches, not three witches who happened to be sisters,” solidifying the themes of familial ties and the importance of sisterhood. According to Combs, one of the best parts about doing conventions is that it’s like a family reunion almost once a month, which she goofily admitted she was unsure if this was a good or a bad thing. But more importantly, Combs is extremely grateful to get to meet fans face-to-face and hear how influential the show was to them. It never ceases to amaze her when fans approach her with their stories and significance of how the series has impacted them, whether it be helping deal with depression, anxiety, or even remembering a loved one – a thing that Holly feels is extremely magical and special. When making the show, the anticipation on how intimate the fans would relate to the series was never seen, but never ceases to amaze the cast time and time again as they continue to visit conventions like this. When asked what we can expect from Holly in the future, she very lovingly said that she is enjoying this time with her children and the joys of being a mother. As mentioned before, Combs is a mother of four, a third of which will be a teenager this year. But, she didn’t hesitate to mention that once she makes sure they all grow up to people decent humans, she will definitely return to work, as I assured her fans will lovingly welcome her back and anticipate her next project. Wizard World Comic Con is happening all weekend, April 5th through the 7th. Weekend passes are available, as well as individual day passes. Holly Marie Combs and fellow “Charmed” cast members will be appearing all weekend long at the event, with several scheduled chunks of time carved out for autograph signing and photo opportunities, including a panel on Saturday that is sure to be something any “Charmed” fan won’t want to miss!